Astri Wayadande - Astri Wayadande, Ph.D.
Dr. Wayadande is one of the first researchers funded by CPS. 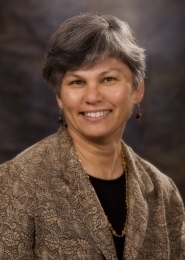 "Dr. Wayadande is a respected vector entomologist, recognized nationally and internationally for her work on insect transmission of plant pathogens," said Dr. Jacqueline Fletcher, Director, National Institute for Microbial Forensics & Food and Agricultural Biosecurity, Oklahoma State University. "Her research provides a novel perspective on the question of how human pathogens move within and between natural and human-altered ecological niches." CPS student staffer Alyson A. Barnes spoke to Dr. Wayadande recently about her career path and research. What brought you to Oklahoma State University? I followed my husband to OSU in the early 1990s and was offered a postdoc with Dr. Jacque Fletcher in Plant Pathology and I've never left. Dr. Fletcher encouraged me to stay in academia during a time when faculty positions were few and far between. We developed a successful research team that continues to this day. I was attending a meeting in 2008 with my colleagues for a Fresh Express project. I was encouraged to go to the CPS website because CPS would be advancing this field of research. So why did you follow through and apply for funding from CPS? The RFP was perfect timing after the findings of the Fresh Express research. I saw the request for research for possible role of insects and realized it was a good opportunity to continue our work. We were encouraged by our colleagues at Fresh Express to apply for the funding because it was an area that needed attention. CPS recently awarded funding to your project "Fly reservoirs of E. coli O157:H7 and their role in contamination of leafy greens." What do you believe the industry will gain from your project? We hope to answer critical questions as to what role filth flies might play in movement of pathogens to leafy greens. We want to find science-based answers to these questions and get the information to the growers to help them make informed management decisions. What would you say then are the key factors influencing this field of inquiry? Insects respond to changes in the environment, sometimes in unexpected ways. In many cropping systems, we have moved from small diverse farms to larger monocultures. If we can identify factors that influence fly movement to plants to determine whether or not flies contaminate leafy greens with human pathogens in the Salinas Valley ecosystem, I think we will have made some contribution to understanding one possible route of contamination. Where do you see the field of food safety research ten years down the road? Ten years is an extremely long time. Driven by what is happening in the industry now (high demand for fresh, conveniently packaged produce) I believe that the fresh produce industry will have implemented technologies (such as post-harvest sterilization) that make packaged greens even safer. When you aren't busy conducting research, how else do you spend your time? Although I work most of the time, the rest I spend with my family. My husband and I are professional growers and we grow fruits and veggies on our small farm for our CSA. Anything you can grow in the Oklahoma heat, we try. We also grow cut flowers which we market through a local wholesaler. I'm also really enjoying my two teenage daughters, one of whom is about to start driving! Lastly, what would you consider one or more of your career highlights? The first time I had a major grant funded was a definite highlight, but I would also include getting that first academic position here at OSU.